The Pachyrhinosaurus (PAK-ee-rye-no-SAWR-us) is one of the Creatures in ARK: Survival Evolved. Pachyrhinosaurus Mitisaura is a medium-sized herbivore, found almost everywhere but the Island's mountains. It is generally calm and ignores all other nearby creatures unless it is attacked. Pachyrhinosaurus possesses a particularly unique survival skill. When threatened, its massive nasal-boss releases a chemical into the air that calms other nearby creatures, making them less likely to attack it. Affected creatures are sometimes hungry enough to ignore the effect, and humans seem immune to it. Conversely, it can seemingly invert this phenomenon at will and coerce creatures into attacking it! Pachyrhinosaurus is an excellent starting mount for anyone new to taming. It is fairly easy to train, can carry enough to be a simple pack-animal, and is not as deadly as some of the larger herbivores. Additionally, Pachyrhinosaurus can release its unique chemical on command to protect itself and its rider from nearby predators, or draw attention if desired, making it a potential life saver in a pinch. Pachyrhinosaurus is a non-aggressive herbivorous species that spends its time grazing across the Arks. Ignoring peaceful survivors and other passive creatures, many players tend to underestimate this creatures capabilities. If attacked, the Pachyrhinosaurus will often charge its attacker, much like the Triceratops. However, different from the Trike, it can also release chemical pheromones which affect surrounding wildlife, including normally passive creatures. Upon being attacked, it will release a red chemical from its nostrils, sending nearby creatures into a rage and making them target the creature's attacker. Even creatures like the Dodo or Parasaur may enter the fray, though some herbivores like Carbonemys and Triceratops seem unaffected. However, if the battle seems fruitless for the Pachyrhinosaurus, it will flee and release a different, calming chemical to try and pacify its attackers, allowing the dinosaur to escape and recover. This chemical will not work on humans and some huge predators such as Tyrannosaurus Rex and Giganotosaurus. Like its larger relative the Triceratops, the Pachyrhinosaurus is a burly quadrupedal herbivore with an impressive frill. Unlike the Triceratops, Pachyrhinosaurus has a bony growth called a boss where the trike has its nasal horn. The animal still displays a multitude of horns and spikes on its frill, though none as large or as fearsome-looking as those on a Triceratops. This section displays the Pachyrhinosaurus's natural colors and regions. 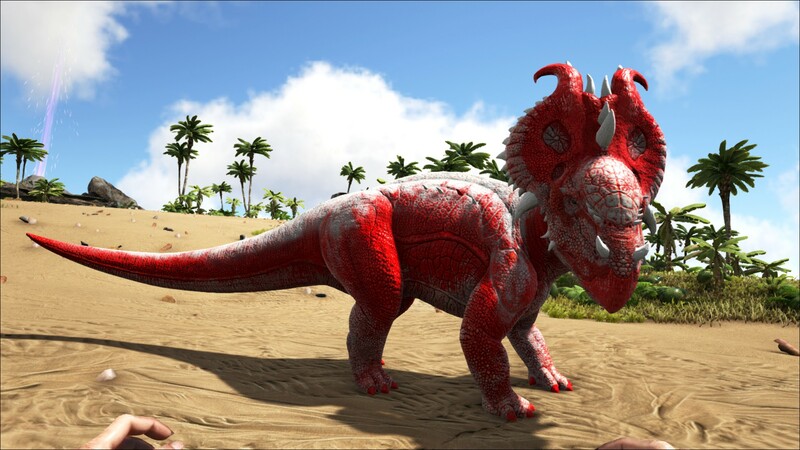 For demonstration, the regions below are colored red over an albino Pachyrhinosaurus. The colored squares shown underneath each region's description are the colors that the Pachyrhinosaurus will randomly spawn with to provide an overall range of its natural color scheme. Hover your cursor over a color to display its name and ID. For example, "cheat SetTargetDinoColor 0 6" would color the Pachyrhinosaurus's "body" magenta. Using the (PC), (PS4), (Xbox One), the Pachyrhinosaurus headbutts the target. The Pachyrhinosaurus has a hardened head which decreases the amount of damage and torpor it receives. Players should shoot the body to knock the Pachyrhinosaurus out faster. The Pachyrhinosaurus also has an extremely fast torpor drop, which can make it quite difficult to knock out at lower levels. The Pachyrhinosaurus' extremely fast torpor drop also make the Crossbow and Tranquilizer Arrows superior to the Longneck Rifle and Tranquilizer Darts for knock out due to the faster reload and shorter firing interval, as well as having nearly no chance of killing the Pachyrhinosaurus. If a Griffin is available, it is one of the easiest ways to knock out the Pachyrhinosaurus without using any kind of trap. After regenerating all stamina, fly off the ground to a height out of range of the Pachyrhinosaurus' melee and gas-clouds. Engage the Pachyrhinosaurus with a Tranquilizer Arrow from high above it and as it approaches, it will stop and wait directly underneath the Griffin but not be able to attack it. Angle the Griffin straight down toward the ground, and shoot Tranquilizer Arrows through the Griffin's head (this does no damage or torpor to the Griffin). If lined up (watch for hit-markers to verify), the arrows will land directly in the body of the waiting Pachyrhinosaurus. The position above the Pachyrhinosaurus makes the body a much more reliable target! Count your shots, and soon the Pachyrhinosaurus will begin fleeing due to high torpor. Land the Griffin and chase/shoot the Pachyrhinosaurus from the back of the Griffin as it runs away to finish the knock out. Keep in mind that you need a lot of Bug Repellant to tame a high level Pachyrhino - 77 Bug Repellant equals 308 advanced crops to produce which is more than twice than a single crop plot can hold. This section describes how to fight against the Pachyrhinosaurus. The Pachyrhinosaurus's head acts as a shield, much like the Pachy. It has a damage multiplier of 0.15 for head and jaw. The Pachyrhinosaurus takes more narcotics than most herbivores to keep down. It also has a unique diet, preferring bug repellent to vegetables or berries. Don´t use small dinosaurs, because they mostly won´t even hit the Pachyrhinosaurus, because of the knockback. Pachyrhinosaurus is not immediately aggressive, so use crossbows or bows as they have shorter reload speed than a longneck rifle. It can help a little if the first shot is fired with a longneck, because this inflicts more torpor (even though the difference almost unnoticeable). The Pachyrhinosaurus can trigger others to attack, making engagement dangerous. Its nasal spray will also instantly drain the stamina of you or your mount, leaving you vulnerable to aggressive dinos such as raptors or carnos. It can carry 2 players in its saddle (Level Speed and Stamina). Calm essence: Its alternate attack (rmb) expels a calming essence that makes you invisible for most hostile dinos (Doesn`t work with bigger ones like Rex or Giganotosaurus). Raging essence: Pressing c will expel a raging essence that makes a variety of dinos attack you, such as Dodos or Parasaurs. Some herbivores like Carbonemys and Triceratops may still ignore you though. Level Health, Melee Damage, Speed, and some Stamina. The Pachyrhinosaurus has a good carry capacity and is ideal for local transport. Its calming essence can also be useful if you run into small to medium-sized carnivores such as Raptors and you don't have a convoy or simply don't want to fight (Level Weight, Speed, and Stamina). Rock Drake and Wyvern ignores survivors on Pachyrhinosaurus if the chemical is active, but will still chase after them if their eggs are taken regardless. Dossier revealed on 09/24/15 on Steam. Pachyrhinosaurus is from the same family as Triceratops. The real Pachyrhinosaurus was approximately 8 meters long and weighed around four tons, with a pattern of horns much less elaborate than the one illustrated in the dossier. There is no evidence that it released chemicals in self-defense. The dossier suggests that the Pachyrhinosaurus is easy to tame, but keep in mind that its torpor drains extremely quickly. The Pachyrhinosaurus can use its chemicals to make creatures that run attack you. Be careful!! ↑ Introducing the Pachyrhinosaurus & Community Crunch 20! This page was last edited on 14 April 2019, at 16:39.